In the previous section, we looked at the performance of a G.hn device compared to one of the recent HomePlug AV2 products. Both products aimed at extending a wired network. Moving on to products that aim to improve Wi-Fi reach specifically, we again take a look at another G.hn device. For comparison of the performance of a wired power line backhaul against wireless backhaul, we go for a mesh Wi-Fi system with two nodes. With respect to the PLC segment, the SBX-AC1200P is similar to the SBX-1000P that we saw in the previous section. However, the slightly larger footprint enables the integration of a 2x2 802.11ac/b/g/n simultaneous dual-band chipset. This chipset is again Broadcom-based, similar to the SBR-AC1900P. However, the actual SoC is the BCM47189 which integrates a 2x2:2 802.11ac (5 GHz) radio along with the CPU (ARM Cortex A7) and switch. The 2.4 GHz radio duties are handled by the BCM43217 SoC. With a G.hn node at the router end, the power line can act as a backhaul for the access point present in the SBX-AC1200P. A bit of work at the firmware level in both nodes can ensure that consumers/devices see only one SSID that gains strength in the vicinity of the location of the SBX-AC1200P. The mesh Wi-Fi system that we will be comparing against is the Netgear Orbi. As mentioned in the introduction, the Netgear Orbi router and satellite kit operates in a hub-and-spoke model. For our evaluation, we only use one router and one satellite. For most households, this configuration is more than enough to blanket the whole house with Wi-Fi coverage compared to the packs of three sold by other vendors. The reason that the Orbi is able to get away with just one router and one satellite is due to the effectiveness of the backhaul. 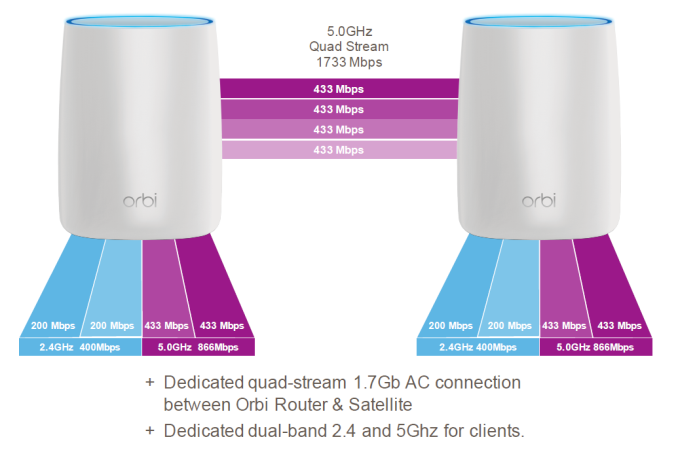 While most mesh Wi-Fi systems in the market use the same radio for both clients as well as backhaul (a drawback depicted in the first section), Orbi uses a dedicated backhaul radio. In addition, most mesh Wi-Fi systems are currently more concerned with the user experience and external aspects, rather than performance under load with multiple clients. While the Wi-Fi reach aspect is solved to some extent (in a manner similar to range extenders), the usage of a single 2x2 radio severely hampers performance when it is used for the backhaul too. That said, some mesh Wi-Fi systems like eero do have a second 5 GHz radio, but, that is also a 2x2 configuration. Orbi's dedicated backhaul is a 4x4 configuration, and that results in some downright impressive throughput numbers, as we shall see further down in this section. Netgear has adopted the Qulacomm Atheros IPQ4019 as the primary network processor SoC in the Orbi. This SoC supports Wi-Fi SON, and that handles a lot of the intelligence with respect to setup and ease of use. A detailed evaluation of the features of Wi-Fi SON is beyond the scope of this article, but, readers can easily recognize that most of the features offered by mesh Wi-Fi systems can trace their origin / concept to what is provided by Wi-Fi SON. Our benchmarks involving these two kits help in comparing the performance of wired power line backhaul and Wi-Fi backhaul with a 4x4 802.11ac connection. The graphs below shows the TCP and UDP downlink and uplink speeds across the six different locations in our test setup. The Wi-Fi backhaul turns out to be better than the wired G.hn backhaul in every tested scenario. Despite our UDP testing script not playing well with the Wi-Fi link. we find that the powerline backhaul is no match for the 4x4 802.11ac link between the Orbi router and satellite. At all the tested nodes, the router and the satellite were able to maintain a successful link over the 5 GHz backhaul. Netgear indicated that in extreme cases, the router and satellite could also end up communicating over the 2.4 GHz band. However, we didn't encounter that case in our testing.